Album review: Broods - 'Evergreen'. You all know Broods by now… they’re the New Zealanders who have the same producer as Lorde and you’ve heard their track ‘Bridges’ and probably fell madly in love. Skip a couple of seasons and here we are, the album ‘Evergreen’ is now ready for our ears. Imagine this, it’s the beginning of August - [ Editor’s note: Matthew lives in London, FYI New Zealanders ] - I’m sat in Starbucks sipping on an iced vanilla Americano. It is super warm outside, I’m trying to keep cool and keep my cool, but that’s hard when you’re listening to an amazing debut album from one of 2014’s most hotly tipped acts. Not a second is wasted in starting this synth-based assault on your ears with the familiar sound of album opener ‘Mother & Father’ kicking off the proceedings. As the official lead-single from the album, this song has a particularly massive sound to it. The sweeping hook will be stuck in your head for days and let’s face it, the lyrics are very relatable. Does anyone really want to wake up lonely or to just be fine? Up next is probably my favourite unheard track from the album, ‘Everytime’ screams future single from the very first beat. It continues in the same vein as ‘Mother & Father’ as a fully-fledged pop song with a few Broods twists and turns. It breaks my heart that some people will never hear this assassin of a chorus. Indie-pop perfection is around the corner with just about every track, but none more than with ‘Bridges’ and ‘Never Gonna Change’. These two tracks, which managed to make the jump from the EP to the full-length, still sound fresh and exciting and are stand-out tracks on this release too. Joel Little’s production is minimalistic and incredibly intricate and you can hear these intricacies throughout the album. There are the quiet things, which you have to listen out for, like the backing vocals in ‘Killing You’ and then there’s a whole other side to Little’s production which is much bigger. ‘L.A.F’ is euphoric and has an almost anthemic sound. I’m hesitant to say it’s a happy track, because there’s still a hint of melancholy even in Broods’ most upbeat tracks, but if you want a “happy” Broods track, then this is the one for you. Just when you think things can’t get any better, they do. Prepare yourself to feel super emo if you listen to the latter end of this album on repeat. The world of Broods might be pretty blue sometimes, but sadness is especially beautiful when it’s put to music. ‘Evergreen’ is ethereal and brought to life with an almost whisper-like vocal from Georgia and a chorus layered with additional vocals from Caleb. The lyrics "since we decided to be infinite, there’s no ending and there’s no fear" hits a nerve. ‘Four Walls’ is really sad too, but this time Georgia’s vocals are crystal clear. This moving ballad is probably the strongest track on the record and if you’re prone to crying at sad songs, this will be the point you’ll need your box of tissues. 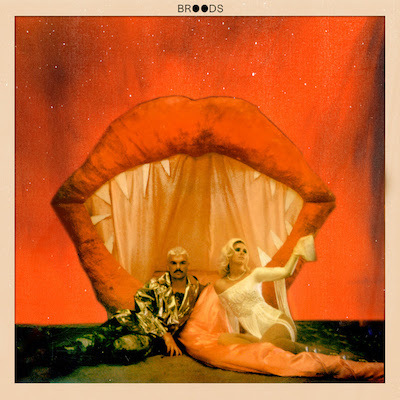 You can definitely hear how far Broods have come since the release of their self-titled EP in January, they’ve both grown and evolved reaching new musical dimensions. Just think, if this is how much progress they can make in a few short months, imagine how great an album released in a couple of years could sound. It’s definitely a grower and even if you’re not too keen on first listen, give it time, maybe even take a break and listen to it again in a week because it should sound even better! This album is not just a bunch of sad stories, it’s a bunch of sad stories turned into expertly crafted pop songs. MusicNZ: Fizzy Milk feat. Jarryd James - 'Make Me Feel'. MusicBroods - 'Four Walls' lyric video.